Spring is a beautiful time of the year in the Northwest. Slugs think so too! Spring rain and new, tender plantings in our gardens are a slug’s dream come true. It’s common practice to set out slug bait to rid ourselves of these pesky mollusks. But it’s important to be safe when applying slug bait in our yards. Slug bait can be toxic to our pets and sadly, slug bait poisoning is a fairly common occurrence. 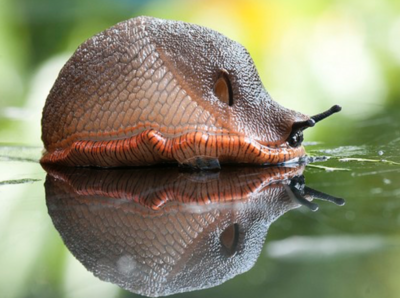 Metaldehyde is a common ingredient in commercial slug and snail baits. It is toxic to all mammals and birds. Ingestion of very little slug bait is required to cause poisoning in a dog or a cat – less than a tsp per 10 lbs. Bait pellets are typically flavored with molasses or bran to attract slugs. They can be attractive to dogs as well. In addition, if liquid, powder, or granular forms get onto the paws, they may be licked off during normal grooming. Dogs are far more likely to be attracted to slug bait, but cats have been known to be poisoned as well. Signs of poisoning begin to appear fairly quickly after consumption. The first sign is typically anxious twitching. Left untreated, twitching progresses to outright seizures. The twitching causes muscle contractions to raise the body temperature so high that brain damage can result. Pets may also exhibit racing heart rates, sensitivity to light and sound, vomiting, diarrhea, and respiratory failure. If the toxicity goes untreated, death is a potential result. There is no direct antidote for metaldehyde toxicity. Treatment is aimed at controlling the clinical signs – stopping the tremors, dropping the body temperature, and preventing further absorption of metaldehyde. Hospitalization is usually necessary. If less than an hour has passed since ingestion, vomiting may be induced. Activated charcoal may be given to prevent intestinal absorption, twitching is medically controlled, and IV fluids and body temperature monitoring are needed throughout recovery. While this is a serious toxicity, most patients have a good chance of full recovery if treated properly. Slug bait products should be stored where they cannot be reached by children or pets. Because the amounts necessary to cause poisoning are small amounts, all spills must be thoroughly cleaned up. Most poisonings are related to careless placement of bait. Baits should be used sparingly and spread evenly, and never applied in piles or lines. If using pelleted bait, only a few pellets per square foot need be applied. In the case of slug bait, more is not better! Iron phosphate slug baits are available on the market that offers an alternative to metaldehyde baits and are generally very effective. But although they are marketed as safe for pets, kids, and wildlife, they also have their dangers. Slugs and snails are a fact of life in the Northwest. Whatever method you choose to control them in your garden – read labels, store safely, and apply correctly. In case of accidental ingestion, call your vet clinic immediately. The sooner you begin treatment, the better chance of a full recovery!